The binomial distribution is a discrete distribution displaying data that has only TWO OUTCOMES and each trial includes replacement. 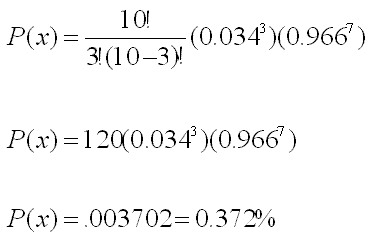 The probability of getting one outcome (success) p is held constant and the probability of getting the other outcome (failure) is also held constant, represented by (1 - p). Includes replacement for each trial. It can be used to approximate without replacement trials but it is suggested to use hypergeometric distribution formulas. A coin flip is an example of two outcomes and each flip has the same chance for both outcomes (meaning independent). Flipping the coin n amount of times means there are n identical and independent trials. Nothing changes from one flip to another and the odds are the same for each flip. 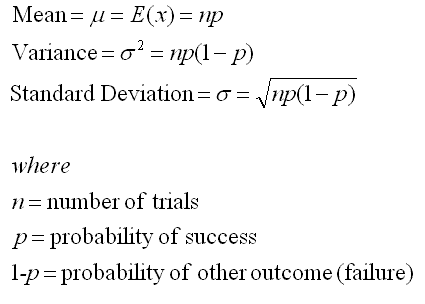 The following formula is used to compute the number of experimental outcomes resulting from x successes in n trials. A manufacturing process creates 3.4% defective parts. A sample of 10 parts from the production process is selected. What is the probability that the sample contains exactly 3 defective parts? There are two outcomes: Defective / Not-Defective, therefore the Binomial Distribution equation is applied. Need the probability that x = 3. 79% percent of the students of a large class passed the final exam. A random sample of 4 students are selected to be analyzed by the school. What is the probability that the sample contains fewer than 2 students that passed the exam? Solving for the probability that x < 2. Note that we need to compute p(x<2). So, it is necessary to add the P(x=0) to the P(x=1). Each P(x=0) and P(x=1) must be calculated separately and added. There is 3.12% chance of selecting fewer than 2 students that passed the exam when randomly selecting 4 students when 79% of them passed. There are also Binomial tables that can be used when the input variables are known (and found within the table).